You know them as office chair alternatives. You may have also seen them piled up in a fitness studio. But did you know that there's a myriad of strength and conditioning exercises that you can do with a stability ball? Before getting started, make sure to select the right size stability ball. Some exercises actually require a smaller than normal sized ball. The majority of stability balls are available in three diameters: 55 cm for individuals between 4'11” and 5'4”, 65 cm for those who stand between 5'4” and 5'7” and a 75 cm size for those who are 6' on up. Sit on the ball to test it out. If your knees and hips create right angles at the floor, you have a properly sized stability ball. Pick out a wobbly stability ball for this upper body exercise. It will really help work your arms and shoulders. Extend one leg behind yourself, place your forearms and elbows on the ball and put your other foot back with the one that is extended so they are parallel to one another. Maintain this pose for as long as you can. Try to make it to thirty seconds with each rep.
A stability ball really adds a fun new element to the traditional push-up. Begin by laying on top of the stability ball with your face pointed downward. Let your hands and feet reach the ground. Your stomach should be squarely on top of the stability ball. Let your shins touch the ball and keep your torso in a position to perform a push-up. Then lower toward the ground until the top of your arms are parallel to the surface. Return to the beginning position and perform 5-10 times. The overhead ball squat will work your arms as well as your legs. 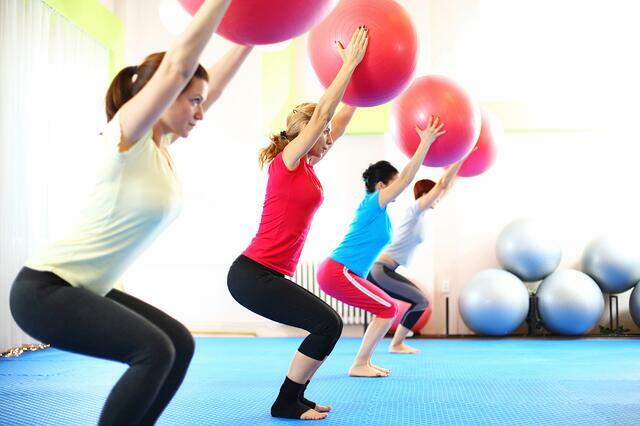 Perform a normal squat but hold the stability ball out and overhead. Maintain an upright posture with your torso and back. You will feel the strain on your deltoid and shoulder muscles while performing the ball squat. It's a sign that they are being pushed to their max. Perform the exercise 10-15 times. Position yourself about three feet away from a wall. Keep your feet spaced out to the width of your shoulders. Put your back near the wall and place the stability ball between your lumbar region and the wall. Slowly squat until you create a 90 degree angle between the legs and knees. Let the ball support your back as you roll it from the bottom on up. Perform 10-15 times. Lay with your back on the floor. Place the stability ball beneath your ankles. Roll up your torso so that your body forms the letter “V” with your low-set hips. Hold this pose for five seconds or as long as possible. Slowly roll on back down to the floor. Repeat 10 times. The Ball Jog will really get your blood pumping. It is also plenty of fun to perform. Begin by sitting upright on the ball. Flex your ab muscles and keep your feet on the ground. Lift at your knees to bounce yourself up and down on the ball. Bounce for as long as you can. Hopefully, you will be able to bounce for at least two consecutive minutes in order to give your heart a good workout. You can also use the Ball Jog as a warm-up drill that leads into other stability ball exercises. These fun, bouncy stability balls are often underestimated! While there are several benefits to using free weights or resistance bands, stability balls offer just as much opportunity to build and tone muscle- give it a try!